I have been following with interest your speeches, which I have read and watched on Damien Mulley’s site. I’m not sure what the hell those speeches are about because you are rambling around like a whippet on the trail of a rat. I gather it’s something to do with broadband, foreign companies and the standard of our education? Quite frankly, your speech and grammar are so bad that I haven’t a clue what the hell you are on about. Whatever great educational system we have in this country, it is patently obvious that you never availed of it. As a gesture of good will, I would like to give you a little lesson. Ireland is a country that consists of 26 counties. I won’t list them all, because I know that would confuse you. Northern Ireland [that you talk about so much] has 6 counties. You are supposed to be the leader of the 26 counties bit. That is called The Republic. Got that? Good. Now one of the 26 counties [Republic? Remember?] is Cavan. Yes. It is in the Republic. It is not one of the other 6. I know this is terribly confusing, but when you’ll find you’ll get the hang of it when you get up to Primary Certificate level. Now I am going to show you a special picture that’s called a map. It is a picture of Ireland and it shows you the places that you are supposed to be running. They are all coloured. The white bit at the top is Northern Ireland, and you can ignore that for now [like the rest of us do]. Now. Do you see that bit towards the top that has a red line around it? Good. 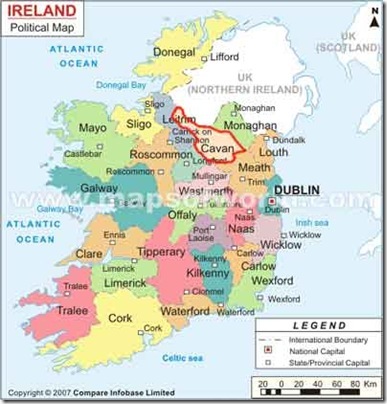 That is CAVAN. It even says the word inside the red line. And you can see that it’s not white, so it must be in the Republic of Ireland. Yes – the country is bigger than you thought. You must be happy. This must be very hard on you because of your extremely limited intelligence, but I don’t really want you making a fool of yourself again in front of everyone. P.S. Next week we’ll start on grammar. Now draw another red line around 25 of those counties. That’s the part of Ireland we call Not-Dublin: the part of the country that doesn’t matter. Be fair, Bock. I think I have given him enough to learn for one day. There is only so much that a person of his education can take at a sitting. I don’t know how I’m going to break it to him that a) America isn’t part of Europe and b) that Bush isn’t his leader. Tralee? Ok, I’m in the white bit so I might be wrong/confused/misinformed… But I thought that corner down there was Kerry? Maybe the maps Bertie’s been using are of similar quality. I hadn’t noticed that!! 😆 Well spotted. I don’t know Harper’s voice, but I am sick of listening to Bertie spluttering away. He’s like a drunken father trying to make a speech at a wedding. Bush doesn’t splutter and stammer so much, though granted he speaks the same rubbish. Bock – I was going to make a crack about Gurrier Dub accents, but then I’d only be accused of being a snob! Why did I choose that map? I’d replace it but I couldn’t be bothered. And before anyone mentions it – Laois isn’t mentioned either. So there! Grandad: There’s nothing wrong with a traditional Dublin accent. In Bertie’s case. it’s the way he tries (and fails) to inject what he thinks are “posh” pronunciations. Listen to the way he says “area”. I completely agree, Bock. I have no problem with it at all. I would define his accent as Gurrier Dub simply because a) he’s a gurrier, and b) he’s from Dublin. In fact his accent drifts from ‘Ordinary Dublin’ to an attempt at ‘D4’. He’s trying to sound educated but his words done give de game away. Exactly. He’s ashamed of his own people. Thank you for the pretty picture. Which of those houses is yours? I have a little widget on my blog sidebar that says “headrambles – 23 days ago”. Please get the map right because when I come over, I’ll get lost and then I’ll have to ask some old geezer for directions and we all know where that leads! Again, who voted for him? Nobody is owning up! He has to go, anyone know how we can get rid. RhodesTer – What houses? Are you trying to confuse me again???? And that little yoke on your site is BROKEN, because I was there yesterday [or maybe the day before], and I went again just now but it still says 23 days. Baino – That is the whole idea, We don’t want tourists getting independent, otherwise they’d never get shot. Kate – Hi and welcome. It’s always nice to see a new face. It baffles me how anyone could be so gullible as to elect that lot yet again. But I suppose people will say there is no alternative? Personally, I’d prefer no government at all!!! Granddad, OF COURSE I was trying to confuse you again.. it’s fun AND easy. My apologies.. that’s what I get for trusting technology over my elders. Thank you for visiting, please come again. The depressing thing is that if there were an election in the morning, Bertie’s party would again sweep in. There is no credible alternative. Fine Gael haven’t yet got back to where they were in 1997. Biffo is just biding his time. Your map is complete bollox. Blame Compare Infobase Limited. It's their map.